Given the fame of the Juliénas appellation I would have thought that organic viticulture had a few followers in this northern Beaujolais village, but here is the only family winery based in Julienas that is farming organic : The Domaine David-Beaupère is a fairly new domaine as it was formally set up by Louis-Clément David-Beaupère in 2008. 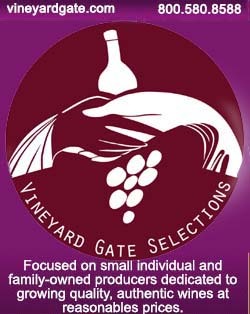 The founder wasn't initially in the wine trade, working in finance and other fields first, his own father was a doctor but the family owned land and vineyards which were exploited by a farmer (fermage), the wine being mostly sold to the négoce. When he started the domaine and until 2014 the family vineyard surface was only 4 hectares and Louis-Clément added since then a couple of rented parcels (including one in Moulin-à-Vent) to diversify his wines. From what I understand Louis-Clément's father also made a bit of wine for himself and sold some, but this activity was never fully developped as a full-fledged business. The wine farm sits alone at a distance from Juliénas (pictured on right as seen from the front of the house), no neighbors and there's a beautiful view in front of the old farm. His father bought the place in the 1960s' and from what I understand one of the reasons Mouis-Clément embarked in this winery adventure was not only a dissatisfaction with his former activity but the will to develop this family domaine which I can understand also when I see the beauty of the place. His initial training was not really adapted as he was into finance and commerce, and he had to study viticulture, which he did from 2005 to 2007 in Lyon at Isara. Louis-Clément toured us around (I made this visit with Aaron who told me about the domaine). The family farm is also a bed & breakfast, complete with swimming pool and stunning view on the Beaujolais hills. Louis-Clément showed us first the chai with its traditional cement fermenters. That's where the carbonic macerations take place as well as the fermentations. This large barn-like room is not really underground, it's the traditional chai on the street level like they do in Beaujolais, but the walls are thick and this can remain cool in summer. A few steps lower in the next room we see what can be called a storage room where Louis-Clément keeps both his pallets of bottles and wine in vats. The place is noticeably cooler and the wine can wait here before being bottled. The bottling is made by a service company. While having initially studied and worked in another field, Louis-Clément had always been loosely connected to the local wine culture, taking part to the harvests (he had an uncle in the nearby village of Emmeringes who had a large estate). But still, when he got the reins of the family domaine that was pretty hard to adapt, especially that the viticulture school doesn't make you a functioning vigneron overnight and also he was starting this thing alone without an experienced mentor at hand to buttress him. Regarding the natural vinification this came to him through meeting people and tasting certain wines which he liked, and he got opened to the idea to vinify without additives and using only wild yeast. Asked about any other organic grower based in Fleurie he confirms there is none, even if some are working "more naturally" than others in the vineyard. In another half-underground basement we find the barrel room with also a few tables when they want to taste wine or have lunch with the pickers. The room wasn't very cold when we visited, it's certainly colder in winter. There used to be many more casks years ago, like in 2009 there were 50 barrels but he downsized the wood part, it's now 30 % to 50 %, no more. The barrels seem relatively new but it's just that they're clean and there's no mold here by lack of humidity. We drive to Vayolette, a vineyard climat of Juliénas sitting on a sharp slope. The area is very scenic, we're far from the plain configuration here, the vines must struggle in summer because of this slope. Here he either already uprooted this summer or will do later for the rest with the long-term goal to have the whole surface workable with machinery, in particular with his Kubota craler tractor. For this he needs more width between the rows, 2 meters instead of the 1 (1,05 meter exactly) today. He'll trellis the vines and will keep the grass and just mow it regularly, hoping that the competition of the grass will make for the lighter competition between the vines. He will replant this surface with massal selections. He will occasionally plow under the vines with his crawler tractor. These vines here were planted in the 1970s'. He'll restructurate the whole slope, erasing narrow terraces that were put in place decades ago at mid slope to allow the passing of the tractor for the conventional sprayings. He will do like a neighbor did nearby (picture on right), levelling the terrain to get a surface on which it's easier to work. Speaking again about the 2 meters between the rows, he pondered the idea (which is commonly objected as hampering thge healthy competition between the vines) and he now really thinks that the grass will be very positive, and he will also sow different herbs to better the soil and purify it, as a compensation for the fact he skipped the usual 3 to 5 year rest that is usually needed between the uprooting and the replanting. The soil here is very interesting and yield wines with tension and minerality, this soil is thick with blue stones (he picks a few of them) like in the Côte de Brouilly. These blue stones are metamorphic stones, not granitic or sedimentary and this translate in a particular minerality in the wines. We then drive further to his newly rented parcels in Moulin-à-Vent. Again beautiful vista. 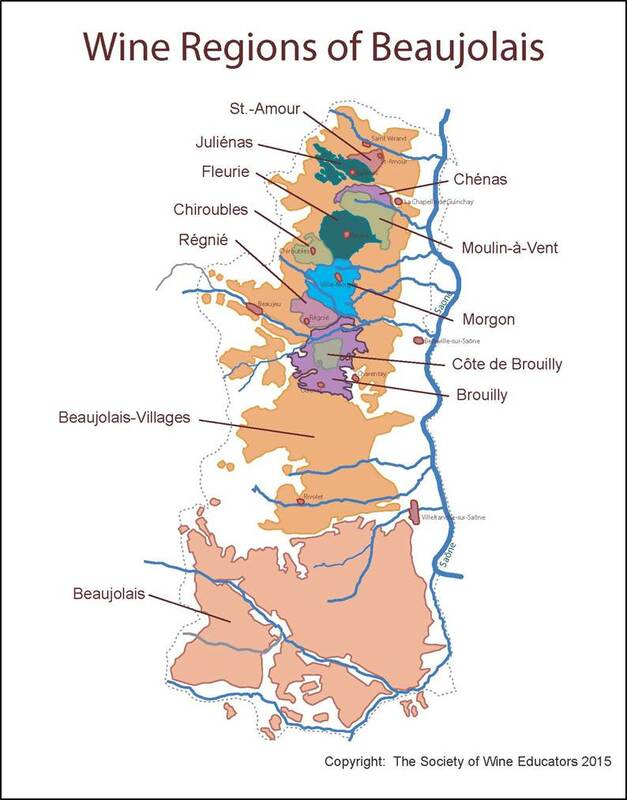 As you may know, the vines of Moulin à Vent are located all around the village of Chenas, and the vineyard of the Chenas Appellation are not there at all, but at a good distance from the namesake village, that is an oddity of the appellation system and naming. The climat name here is Chassignol and another oddity is that on this climat or lieu-dit, there are both Moulin-à-Vent and Chenas parcels, as the climat overlaps the 2 appellations, you just keep walking and suddenly with the administrative limit (no obvious terrain, or terroir difference) you find yourself in Chenas. To reach the vineyard Louis-Clément makes good use of his Toyota 4X4. Once on the Moulin-à-Vent parcel we can see on one side the village of Juliénas, on the other side the village of Chénas, and down the slope far away, the family winery buildings. His newly rented surface on Moulin-à-Vent makes 1,4 hectare, the surface was planted in the early 1950s' and the vines are very tired, the vineyard has been farmed conventionally for years even if grass was recovering all over when he first saw the parcels. Here also he began to uproot part of the surface (pic on left) with the goal to replant wide inter-rows. With the herbicide there was a problem of erosion even though the slope was more moderate than in the other parcel we visited, but this erosion problem will go away with the grass. His vineyard here sit on both sides of this grass road. Pic on right : view down the slope from the Moulin-à-Vent parcels, the family farm is one of the houses in the far. As we drove on a dirt road to his parcel of Moulin-à-Vent we had this view on the village of Chénas, which again, has no Chénas vineyards around it, all the vineyards you see here as well as more in my back are Moulin à Vent. It's only when driving further from Chénas that you reach the first parcels of Chénas, and you won't even see the village from them because it's a few hundred meters in my back after you pass this thick hedge and take a differently-oriented slope... Appellations are sometimes tricky to understand. Speaking of his parcels close to the farm which we didn't visit, Louis-Clément says that they remain bright-green when the conventionazl ones near there already got their autumn color, saying it was a proof of health, but he added that he put some fertilizers after I remark that normally it should be the other way around. He says that it's important that photosynthesis keeps going on at that time of the year so that the vines store energy for the following months. On the way back we stopped at Paul-Henri Thillardon, a friend of his who makes wine in Chénas, they're about the same age and Paul-Henri & his brother farms organicly 7 hectares on the Chénas appellation. Louis-Clément says he dropped the previous day at Paul-Henri and stumbled on Jacques Néauport who was there to give advice on fermentations. Jacques Néauport lives now in Ardèche but he comes regularly to the Beaujolais where years ago he played a decisive role in what was to become the natural wine movement. In 2015 his advice is in demand in the region because the fermentations are sluggish, be it because of the high sugar or the hot,, the low acidity or/and the dry summer that weakened the wild yeast. Jacques is doing some volunteer consultancy work for Paul-Henri like for other vignerons in the region, passing now and then at this season in the chais to check the juices and say what he thinks if the winemaker is willing some advice. Jacques Néauport is not as well known, sort of, as Jules Chauvet and Marcel Lapierre but he may have played a larger role than thought in the nascent uninterventionist winemaking. Back in the barrel cellar/tasting room, we sat around the table and Louis-Clément opened the two cuvées he's selling right now. As he got only recently these two parcels we visited there will be at least another year and a half before he has wine to taste from there. __ La Croix de la Bottière, Juliénas 2014. The youngest vines, on the north side..This was the first year he was certified organic. Half whole-clustered grapes, half destemmed, the whole clusters being put in the bottom of the fermenter. 3 week maceration. 10 % barrel (3-vines old). Bottled late march 2015, he'd like to have longer élevages but he hadn't any more wine to sell. Some tannins, light sugary note in the mouth, this is the glycerol, no residual sugar. SO2 added before bottling, 1,5 grams which makes 15 mg free so2, he says, and 35 total if you count the so2 made by the wine itself. __ La Bottière Juliénas 2012. Oldest vines. Next year he may do a carbonic maceration with these vines. Herre it's 100 % destemmed, one year élevage in 100% casks. Bottled march 2014, so got another year of élevage in bottle. On sale since june 2015. Nose : vanilla, mouth also with some wood notes, tannins that behave well on the palate. Feel of concentration on the tongue, minerality. 2012 was a tough year, they made only 15 hectoliters/hectare here. The 2012 got no filtration and on the 2014 he used tangential filtration, which is a lighter type of filtration. He says last year there was a vat where he had signs of brett and he had to filter it but he blended this vat with a non-filtered vat to smoothen the drying impact of the filtration. In 2015 he says as for now no signs of brett, so he may not filter. But anyway tangential filtration is softer and leaves the wine more whole compared with an earth filtration. Speaking of his future cuvées with the newly rented parcels, the Moulin à Vent will be a carbonic maceration and Vayolette will be partly carbonic maceration. Louis-Clément says that since he began the winery he has changed hiw winemaking practice, doing less extraction for example : at the beginning he used to do lots of pigeage (punching) and remontage (pumping over) on long-time vattings, things which he doesn't do anymore. Extraction comes fast already with destemmed grapes so it's not good to add more. With the intoduction of carbonic maceration the wines should change further. The wines of the domaine are exported to the United States (Sacred Thirst, Natural Selection Wines, Verity Wine Partners), China, Canada (Quebec - Anthocyane). His production is limited, he made until now 12 to 13 000 bottles, this year he'll reach 18 000 and will develop his European sales.